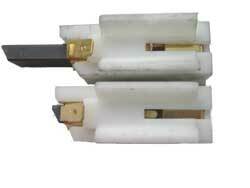 This article is about the old (no longer used) carbon brushes that slotted into the motor. Most brushes are now inside a holder and fixed to the motor with screws. Hotpoint motors attached to the top of the tub can be accessed better by removing the small top tub weight. It’s possible to remove and fit a new brush with the tub weight in place but it’s awkward. If I’m not removing the weight I use a small stubby flat bladed screwdriver bit to lever the old brush out. Some people prefer to remove the motor. If removing the top weight you have to watch out for over tightening when replacing it, which can sheer the bolt or break the tub bracket, but if you don’t tighten it enough it could work loose over time and cause damage. Don’t use a tool that can generate too much leverage. If removing the motor you need to ensure the belt tension is correct when refitting. Note the tension of the belt, and mark the position of the motor by marking it against the tub fixing bracket. However, if the belt is already too slack through wear you would be better tightening a little when replacing. It should have a nice "ping" when plucked but not be so tight there is little movement. It should be tight enough to not slip under load but still have about a quarter of an inch play either side. This is a new pair of Hotpoint carbon brushes. They are the later laminated type but fitting instructions are identical for the older (black) type. Look at the main plastic body and compare the small brass lugs in the brass strips, which are in the centre towards the back. The top brush has had the small brass tag released (and the carbon brush has popped out) and the bottom brush is still held captive because the small brass tag is still pressed in. You should receive the carbon brushes with both brushes held safely inside the holders like the bottom one. If one or both have come out of their holder then push them back inside. The best way to fit them is to slide them into the motor with the brush retracted and captive inside the holder. Then, when the brushes are pushed all the way in the motor so that they click in place, you should bend the small brass lug away to release the captive brushes. Make sure you bend the lug as far as it will go (out to a 90 degrees angle) or the brush may stick inside the holder and cause problems. I personally use a Stanley knife blade to do this. It is easier to release the carbon brushes before inserting them into the motor but this is not the proper way to fit them. The reason for this is that releasing them first carries a risk of the carbon brush snapping, or riding over or under the armature when you push it into the motor. You may not be aware this has happened until problems occur later. If this did happen, after some months the brush could break or be worn in half and the spring released into the motor causing extensive and expensive damage. Professional washing machine repairers usually clean the commutator with a comm stick. The commutator is the ring of copper segments that the brushes run against. When new, the commutator is clearly copper-coloured but the carbon brushes deposit black carbon on them. In theory new brushes should run OK on an uncleaned commutator, after all, the carbon brush is made up of highly conductive material and the old ones ran OK until they stopped making contact through wear. In practice though, few engineers would be happy to fit new carbon brushes without cleaning up the commutator and it can make the difference between having the new brushes bed in successfully or not. A comm stick can be purchased but it’s an extra expense costing around £10. When I had no comm stick available I used to use a very fine emery cloth. NOTE: using sandpaper, or anything other than a very fine emery cloth can scratch and damage the commutator or embed grit or sand into the soft copper. This can cause sparking and big problems. Is it safe to repair my own washing machine? Thank you for this information. My problem is that I cannot get the black holder out of the machine. I have removed the weight, removed the electrical connectors, and cannot find where to lever with the ‘small stubby screwdriver’, or any other way to get the black holder to budge. Any hints would be appreciated!! Hello Jane. I presume this is a very old washing machine with the brushes that slot into the motor? Brushes are now inside a plastic holder and screwed to the motor with 2 screws. For the old slotted-in ones there is a small square hole at the side of the motor where each brush slots in. The screwdriver needs to go in there and release the plastic flap that’s stopping the brush and holder from sliding out.